I have just watched the second episode of Go! Princess Precure. I have to say at the very first episode, it was love at first sight, and after the second episode, I am truly enamored with this series. As a part of my Japanese studies, I made myself get through Happiness Charge Precure, and I worried whether there would ever be a good Precure again. (I actually found myself bored through the Happiness Charge finale, and I could not wait until it was over). I am overjoyed that Go! Princess Precure seems to be the Precure that I know and love! What is not to love….the clothes, the music, the dancing, the aisatsu* (“gokigenyou”), the Princess theme, the transformation scenes….even without deep meaning, I would be in love with this Precure! Yet, to top it off, Go! Princess Precure does seem to have a deeper meaning, which was set forth by the second episode. Interestingly enough, this apparent meaning is quite directly related to the very purpose of this blog. In the very first scene, we see Haruka-chan (who will be the Pink Precure of this series) being ridiculed for her dream of becoming a Princess. This blog was written for girls such as her, who dream of beauty and innocence, but who are ridiculed by the Western world. In the next scene, she meets Kanata-sama, who tells her never to give up on her dream. As Cure Dolly has previously written, the topic of this series was clearly set forth in the first episode…dreams and despair. This is not a new topic for Precure. Dreams and despair were previously addressed in Yes! Precure 5. Interestingly enough, the Blue Precure of Go! 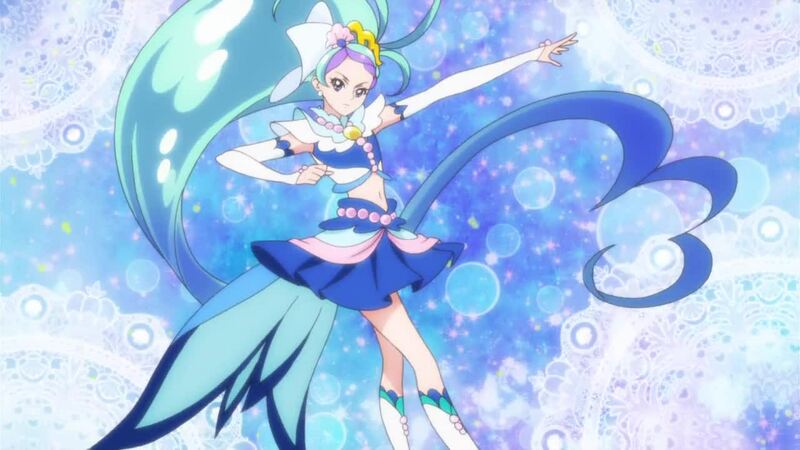 Princess Precure, Cure Mermaid, is similar in type and temperament to the Blue Precure of Yes! Precure 5, Cure Aqua. While the Pink Precure always represents the ganbari (doing one’s best, never giving up) of her particular sentai, the Blue (or White) Precure always represents its kangae (thinking and careful consideration). In some groups, this Cure is stronger than others, but for the two centered on dreams, the Blue Precure is particularly strong and solid (not to mention kakkoii), the seitokaichou (Student Council President) and an ojousama (upper class daughter). Like Cure Aqua, Cure Mermaid is also practical and down to earth, in contrast to Smile Precure’s Cure Beauty, who is intelligent, but not always very practical (she thinks the summit of Mount Fuji would make a fine Secret Base). In Precure, the side of Evil always turns either precious objects or people into monsters. With the exception of Futari wa Precure, it is either precious objects or people, not both. In Go! Princess Precure, the Evil side again uses people. One of the difficulties with Happiness Charge Precure is that it was very unclear as to how the Evil Side was able to corrupt people and turn them into Saiaku. At one point, I believe that Cure Fortune made a reference to a fault or a failure on the part of the victim, but what that fault or failure was was never clear. From all appearances, the Evil Side could turn a person into a Saiaku willy-nilly, whenever it wanted to. In contrast, in the sounder Precure, there was a clear “hook” for the Evil Side to use. 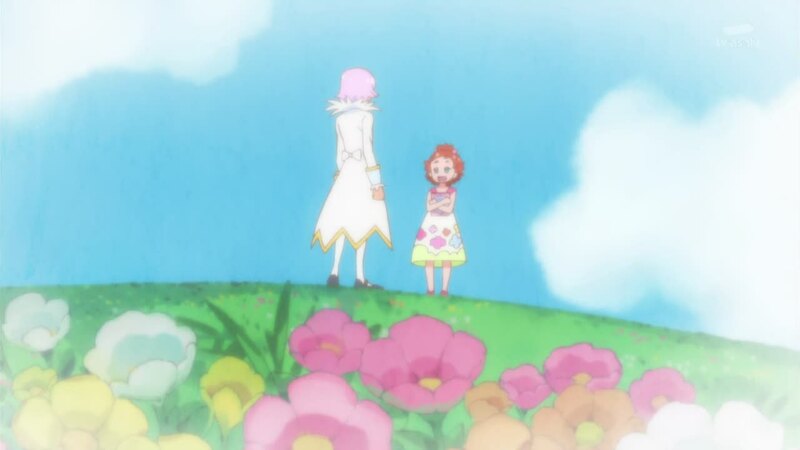 In Heartcatch Precure, the victim’s Heart Flower had withered, and in DokiDoki Precure, a seed of Selfishness had already begun to sprout. In Go! Princess Precure, the Evil Side uses the victim’s dream. This is quite interesting really, as dreaming in and of itself does not seem to be a fault. Yet, Evil can twist even the purest of our traits to its own ends, as we saw in DokiDoki Precure. When our dreams become locked or thwarted, they can become the source of deep despair, leading us to become cynical and bitter, turning us into Zetsubou (Hopelessnesses). While all of this makes sense to me in my heart, I am afraid it would take someone wiser and more Enlightened than me to explain it in words. Like Suite Precure, in this series the theme is directly related to its topic. In Suite Precure, the theme was music, and it was an exploration of wa (the deeper harmony of the Spheres, society, and human relations) and fuwa (disharmony, chaos, and discord). In Princess Precure, the theme of the Princess is directly related to Dreams and Despair. In fairy tales and in metaphysics, the Princess represents the Axial Being, or the one with the power to choose between Good and Evil. There have been several Precures (and fairies) who were Princesses, and each one of them has been central to the battle between Good and Evil on a very personal level. Even in Happiness Charge Precure, it was Cure Princess that opened the box, Axial, and released the Evil that was rampaging the Blue Sky Kingdom and the Earth. (With all of its problems, Happiness Charge Precure was not completely devoid of metaphysical wisdom). In the second episode, we learn that the girls must become true Princesses in order to restore Hope Kingdom. They are also the ones with the power to unlock the dreams of the victims. How do they become true Princesses? They must grow in tsuyosa (strength), yasashisa (gentleness/kindness), and utsukushisa (beauty). ** They must work towards good and beauty and work to become their best selves. By doing this, they can restore the Hope Kingdom and unlock people’s dreams. How perfect for us here at Musume Senshi! Of course, it is still quite early to see if Go! Princess Precure will be another one of the great Precure, but it is off to a very promising start, I think. Tanoshimi shimasu (I am looking forward to it). *the closest English translation for aisatsu is “greetings,” but aisatsu are the proper set phrases one says at the proper time. **on a personal note, it seems rather magical that these are the names of two of us here, myself, Cure Yasashiku, and Cure Utsukushiku.